Gay pride in Uganda: anti-LGBT rhetoric may preclude celebrating in 2016. Last Year, Queer Ugandans Celebrated Pride Like Never Before. But Can They Do It Again? Members of the LGBTQ community and their supporters participate in a 2015 Pride march in a park on the banks of Lake Victoria in Entebbe, Uganda. In April, Uganda entered the gay rights spotlight once again when Rebecca Kadaga, the speaker of Uganda’s Parliament, declared that a harsh anti-homosexuality law annulled in 2014 could return at any time. Homosexual acts are already illegal in Uganda, but the law Kadaga supports would allow harsher sentencing, prohibit the “promotion” of gay rights, and call for the punishment of anyone who funds, sponsors, or abets homosexuality. 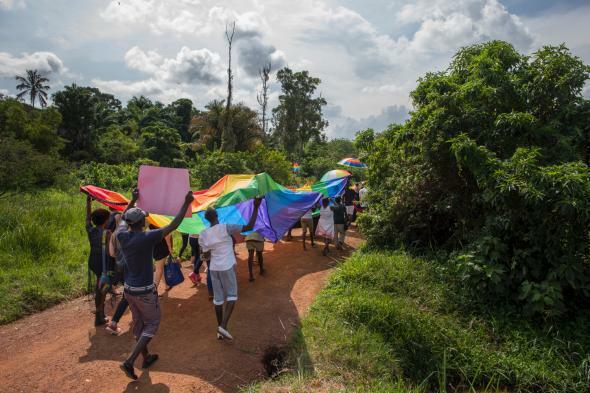 After the widely celebrated success of Pride Uganda last summer—the gathering drew record numbers and seemed to many like a sign of new hope—it’s disheartening to imagine Uganda’s queer community being thrust back into hiding by anti-gay legislation. But was last year’s Pride really an indication of better times for LGBTQ Uganda? And what do Kadaga’s threats really mean to that community? 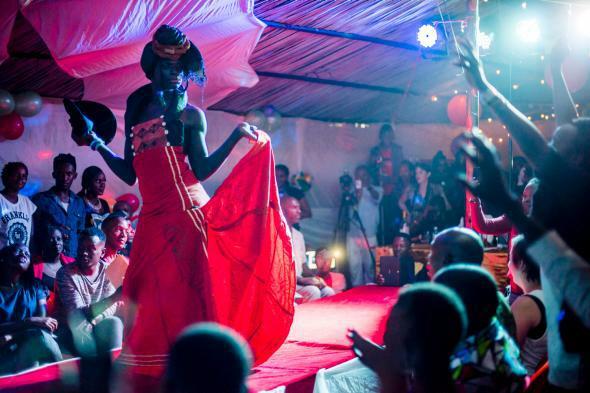 For insight, I spoke with two people deeply invested in these questions: photographer Diana Zeyneb Alhindawi, whose intimate images of Pride Uganda recently appeared in Dazed Digital and Lens Culture; and Ritah, an organizer of Pride Uganda. They helped put Kadaga’s remarks in context—and discussed what Pride means for Uganda’s LGBTQ community in uncertain times. So while Kadaga’s remarks may seem significant to outsiders, they represent something unfortunately all too familiar for queer Ugandans. Contestants compete in the Mister and Miss Pride competition. This sense of freedom is beautifully captured in Alhindawi’s images. As a drag queen, I am particularly captivated by her photographs of the Miss Pride competition, which depict contestants mid-strut on a runway, striking glamorous poses in brilliantly colorful wraps. It’s thrilling to see the confidence and happiness in these scenes, especially when you place them side by side with Alhindawi’s portraits of LGBTQ Ugandans at home. Outside the magic circle of Pride, queer Ugandans worry over money, employment, family, safety, and that worry shows clearly in their crumpled poses and half-covered faces. A transgender woman prepares for the festivities that evening. But there’s no guarantee that queer Ugandans will have that chance again. As Alhindawi notes, Pride Uganda was painstakingly planned to avoid incident, with safety precautions posted for attendees, and careful screening for media representatives to minimize negative attention from the local press. The gathering offered a vital oasis of freedom, but a fragile one that required vigilance from organizers and attendees alike. And the celebration did not go without incident. While leaving a closing event at a bar outside Kampala, Alhindawi and another attendee were separately attacked—Alhindawi was robbed at knifepoint and nearly strangled before being abandoned on an empty road. When I asked Alhindawi what the press misses when discussing Pride and queer life in Uganda and its neighboring countries, she described two frustrations. First, there are too many attempts to make generalized statements about what is really a complex and ever-changing situation. And then, there’s a lack of genuine engagement. “Sometimes [LGBTQ people here] do get quite tired of getting media attention and nothing else,” she told me. “I just contacted an LGBTQ refugee in Kenya, and he told me that journalists tend to write their story and then nothing happens—it doesn’t translate into anything.” Looking at Alhindawi’s images of Pride Uganda—her contribution to an uphill battle—I wondered what I was doing.